The day after Liyana got her first real kiss, her life changed forever. Not because of the kiss, but because it was the day her father announced that the family was moving from St. Louis all the way to Palestine. Though her father grew up there, Liyana knows very little about her family’s Arab heritage. Her grandmother and the rest of her relatives who live in the West Bank are strangers and speak a language she can’t understand. It isn’t until she meets Omer that her homesickness fades. But Omer is Jewish, and their friendship is silently forbidden in this land. How can they make their families understand? And how can Liyana ever learn to call this place home? Naomi Shihab Nye is an award-winning writer and editor whose work has appeared widely. She edited the ALA Notable international poetry collection, This Same Sky, and The Tree Is Older Than You Are: Poems and Paintings from Mexico, as well as The Space Between Our Footsteps: Poems and Paintings from the Middle East. Her books of poems include Fuel, Red Suitcase, and Words Under the Words. 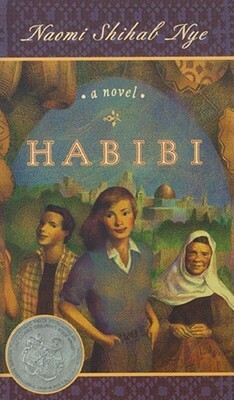 A Guggenheim fellow, she is also the author of the young adult novel Habibi, which was named an ALA Notable Book, a Best Book for Young Adults, and winner of the Jane Addams Children’s Book Award as well as the Book Publishers of Texas award from the Texas Institute of Letters. Naomi lives in San Antonio, Texas, with her husband, Michael, and their son, Madison.